The proposed deposit return scheme (DRS) for plastic bottles and other small drinks containers has the potential to lead to higher quality recycling, according to Vanden Recycling. Defra has announced a consultation on introducing a national deposit return scheme, and the company has welcomed the idea as it is a proven way to improve the quality of the recycling stream. Vanden Recycling UK managing director David Wilson said: “The proposed DRS should be seen as a positive for plastic recycling in the UK. “We currently have very good recycling collections for bottles from home, and DRS should help to improve the ability of consumers to recycle their drinks bottles when out and about. “It should also help litter control and aid an increase in recycling rates of bottles. We also applaud anything that should lead to a higher quality stream of material, and DRS has been proven to do this. “However, we need to work through the detail of the proposal, particularly to see which bottles are included and which are excluded. “Michael Gove and Defra are taking a collaborative approach to improving recycling in general, and we also welcome that the recycling industry and other stakeholders are being involved in these discussions with Government. “Currently, stakeholders across the plastic supply chain are developing a coherent plan to improve plastic recycling. 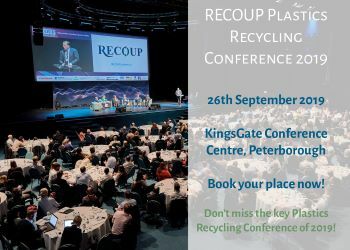 This includes people from manufacturers, retailers, the recycling sector and local government, along with WRAP and INCPEN to bring it all together.